Looking down Tremont Street, Park Street Church and Suffolk Law School are in the foreground, the John Hancock towers can be seen in the background (upper right). 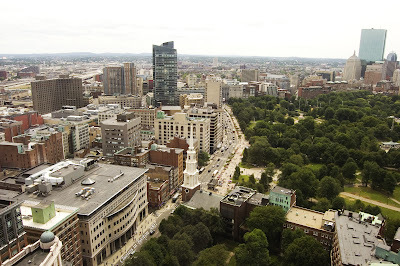 Your "Vantage Point Over Boston" series is splendid! Thanks for your kind words. I appreciate your taking the time to visit and comment. I always learn something new about our city from your photos and commentary.